Susan Hammond, a Penobscot Nation tribal member, is the long-standing Executive Director of Four Directions Development Corporation. As one of the founders, Ms. Hammond has been involved with FDDC since the earliest planning stages, beginning in the fall of 2000. Susan graduated from the University of Maine at Orono with a BS in Business Administration. 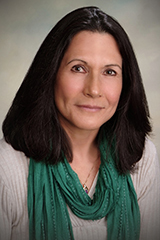 Prior to Four Directions, she worked for the Penobscot tribe for ten years in various positions including the Vocation Education Coordinator for the Economic Development Department, the Financial Manager for the Health Department and the Director of the Tribal Housing Authority. She has completed training from the National Development Council, Fannie Mae, and the Federal Home Loan Bank of Boston. She served on the Penobscot Nation Tribal Council from 1996 to 2004 and was President of the Board of Alnabak Corporation, (later Olamon Industries) a tribally affiliated plastic injection molding company. In 2003, Susan was awarded the Maine SBA Minority Small Business Advocate of the Year Award. She is the first-ever recipient of the Visionary Leader Award from the Opportunity Finance Network/Oweesta Corporation and in 2010 received the Circle of Honor Award from the Opportunity Finance Network / Oweesta Corporation.